Worst case scenario is an offer of £15,000. GO FOR IT!!! That is a TERRIBLE offer for that board! Noel does a vote and gets a split in the Trafford Centre. Dad reckons £10,000 will still do the roof. Extremely, extremely, EXTREMELY very, very, VERY cautious deal & player. The PERFECT ROUND at the PERFECT TIME! He couldn't go for it with a GUARANTEED £10,000??!!! Last edited by johnr on Fri Dec 16, 2016 6:00 pm, edited 1 time in total. £48,000 is £500 ABOVE the average! LIAR! £48,000 wouldn't have happened in live play. Off to Blackpool next Monday on the tour bus! Sadly with just ONE more box to open. he wasn't even 1% brave enough. I see no one was brave enough to encourage him to go on and say just have to open ONE more box. If there was no extra offer then with a 100% GUARANTEED £20,000 would he have been extremely 100% very brave to go for it? Given the player's reaction to the box opening, I imagine he dealt the £26,000 on a strong 8 or 5 box and left a big red to the end along with the £20k, missing out on a huge offer. Here's the spoiler, in case anyone was curious. I thought for sure Danny was going tp have a great comeback and Deal a very generous 5 box offer after that second round, and while he ultimately did the former he certainly didn't do the latter. Still, £26,000 is a great result from a game in which the top 2 went early on regardless, so well done Danny. Congratulations Danny and Holly on your £26,000 win. Well Done. It was a fantastic game at The Trafford Centre and very enjoyable. Brilliant. Last edited by richie4eva1 on Fri Dec 16, 2016 6:31 pm, edited 1 time in total. Recoring it in a place like that then the result was always going to be made public before the game... FACT! Good result from a topsy-turvy game to end the first week of the tour. Hopefully he won't have too many regrets. £26k was one of those offers that seemed good in the heat of the moment when you're there playing the game, but less so after. 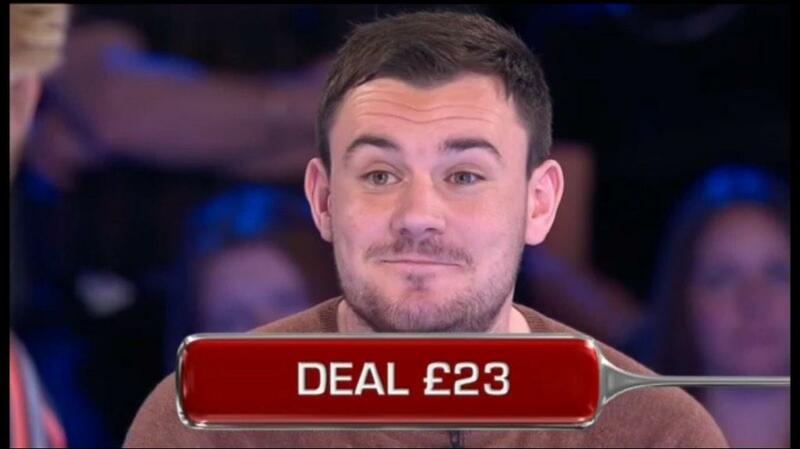 £48k was unlikely to be the final offer - the banker's thinking was probably that it was a multiple of Danny's lucky number 12, but still, doubt he'd have gone that high. Still, a decent comeback from Danny from what started as an unlucky game.